In case you’ve managed to miss the deluge of Facebook post about tomorrow’s solar eclipse I thought I’d add to the collection of write-ups on this celestial event. Before I get into the meaning of this let me first point out some of the technical things that happen with a solar eclipse. By its very nature, a solar eclipse occurs during a New Moon. 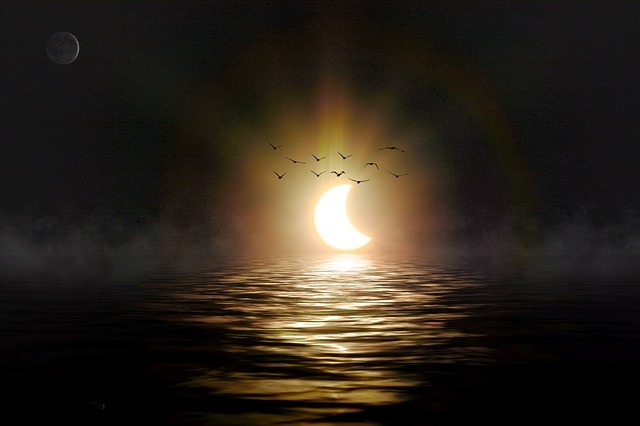 Regardless of what sign it is in and whether or not we are living in a place for the solar eclipse can be seen, the energy of new beginning’s and invocation that all New Moons bring in is a part of the equation and something to take into consideration when trying to understand what a solar eclipse might bring in for an individual. This week’s total solar eclipse will be taking place at 18.53° Pisces. It will be primarily visible in the eastern Asia and western Alaska. And even though it does not occur until March 8th 5:54 PM PDT, not visible in the continental US we will still feel the impact of the eclipsed Sun. This week’s total solar eclipse will be taking place at 18.53° Pisces. It will be primarily visible in Eastern Asia and Western Alaska. And even though it does not occur until March 8th at5:54 PM PDT, and thus not visible in the continental US we will still feel the impact of the eclipsed Sun. Generally speaking, although the eclipse itself can bring things to light- things that have been hidden; the totality of what has been obscured from our view is not fully illuminated until six months later when we will have the full moon in Pisces. (A Lunar Eclipse at 24.20° Pisces September 16, 2016). So, what does all this mean, how can we use this time of the hidden Sun to our benefit? I have written many times on the power of the New Moon, and how it is a time when we can call things to us, make wishes and begin things that perhaps we have been struggling to find our footing with. The New Moon is a time to take that step, that leap, that dive into the new and the unknown. With the added ingredient of the Solar Eclipse, it’s likely our wishes are going to be sprinkled with Tinker Bell’s pixy dust – and our leaps into the unknown are both bigger and more obscured; requiring greater trust that we can indeed fly. To work with this New Moon/Solar Eclipse we are to reflect on things most tied to the sign of the fishes. Pisces is a water sign and is often depicted as two fishes swimming in different directions. Pisces is forever trying to find a balance between the physical and spiritual world. Pisces is tied to our unconscious, poetry, music, spirituality, and the magical. It is also associated with avoidance and escapism. Pisces is both limitless and ungrounded. Pisces is forever swimming back and forth between Narnia and War-torn England – Neverland and the Nursery. These worlds, seemingly unbelievable may, in fact, be true — if we only, like Peter Pan asks of us as Tinker Bell lay dying, clap our hands and believe. It is all these things and more we can look to manifest and begin with this New Moon/ Solar Eclipse. Let yourself dream, dance, sing it into being. The eclipsed will likely extend the timeline of manifestation, but that will only make the outcome that much more memorable.